Karydoglyko (in Greek): Here is another passover favorite, a very simple and easy to make treat, although it is a little time consuming, as it is hands on. Other than that, it has no other choice that to be a success! Think of it as precious truffles – you are not supposed to eat the whole thing as if it were m&m’s, although it’s so good this is definitely possible. Mix well in a big bowl all the ingredients: walnuts, chocolate, sugar and liquor till you have a think paste. With your hands, make small balls (no larger than 3/4″). Wet hands in a bowl of water when they become too sticky. 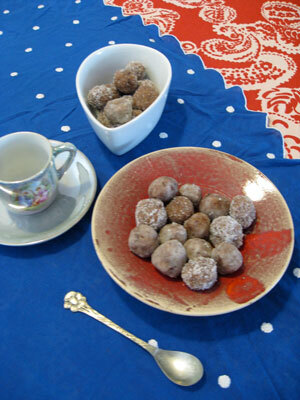 Roll each ball in powdered sugar and set aside in the fridge for a day to mellow. ***The way I do it: I roll a ball with my hands, and then toss it in a medium size plastic bowl, and I shake the bowl, so that the ball is “running around”. A few of those “rounds” will give it a nice round shape, without the hands getting too sticky. Sometimes I swirl a few balls at a time. Then I move the balls into another plastic bowl filled with a few spoons of powdered sugar, do my shake and swirl move, and Voila! All balls rolled and ready! This quantity makes about 20 balls. Double or triple the recipe to make larger quantities.